New XFCE user just trying out PCManFM (as Thunar is bugging on me). Do I need to configure LXDE style outside of PCManFM or something? 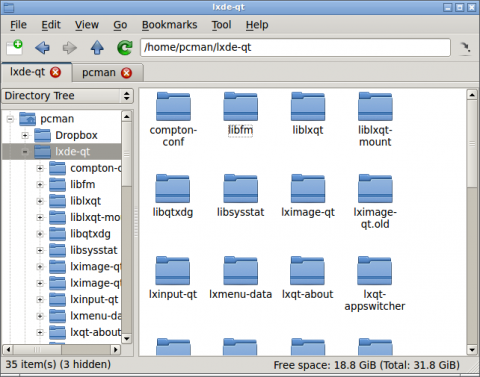 If so, what tool does an XFCE user need? 2. Is there any way I can show show files in the tree itself, not just folders? 3. Is there any way to start the tree from somewhere other than "/"? So say if I want to browse a projects' files, I'd set the tree root to the project root. 4. If 2 & 3 aren't available, do you think they are nice features? are they likely to come? (Note, none of these are available in Thunar either - they all are in Dolphin but I don't want all the IMHO horrible KDEpendencies). Re: Tree View: dotted lines? show files too? alternate tree root? this is lx-qt; i'm guessing pcmanfm is built with qt toolkit. that is most likely a ui toolkit option, in that case qt(4 or 5). if it was gtk, i'd say gtk2 theming is what you need to look at. maybe gtk3. Not sure what you want, but pcmanfm has a "Tree View". You can choose between "Places" and "Directory Tree" in left column menu. "Tree View" starts from either "/ " or "~". Just leave the tree view open with the desired working folder open to have it instantly available next time you open pcmanfm. Is that what you want? seppalta wrote: Not sure what you want ... "Tree View" starts from either "/ " or "~"
"/" and "~" are what I'm calling roots (of the tree, not the filesystem). I'd like to be able to create another arbitrary tree root, say "/projects/projectX/code". Optimally, this would be easy to create and remove, say by just rightclicking a directory and saying "add root" or "set as root". The advantage of this is that you don't have to see and ignore all the folders on the parent directories, which can be quite distracting and uses up a lot of screen space. I can effectively do this in KDE's Dolphin because it allows tree view on the main panel, so I just pick eg "/projects/projectX/code" on the side panel then use the tree view from the main panel (which also displays files, see q#2). I'm guessing there's no way to do this currently. Would it be worth sending as a suggestion? I don't know how hard it would be to code - as "~" and "/" already exist as independent roots it might not be too hard to allow arbitrary ones.